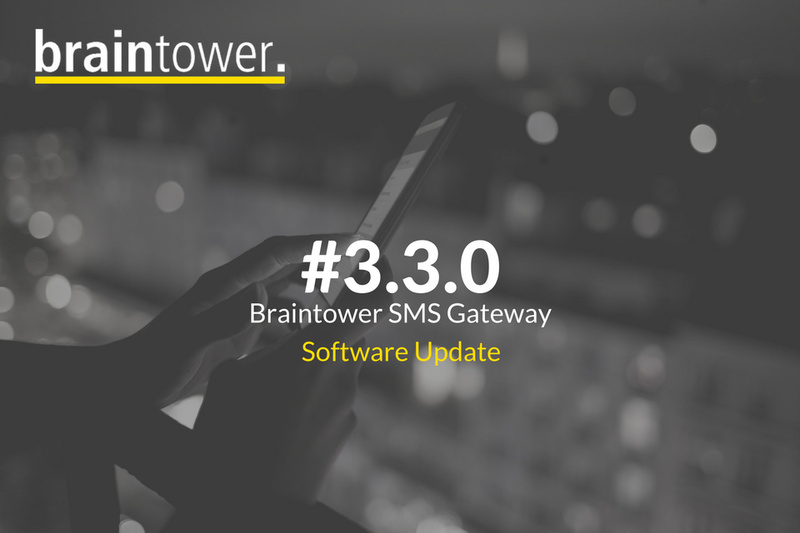 Braintower Technologies releases latest software version of Braintower SMS gateways. as the programmers of Braintower are working at full speed in order to provide new software features, improvements and bug fixes for the ever-growing customer base of the Braintower SMS gateway. First, let’s introduce a new software option that is available with version 3.3.0. The message routing, expand the SMS forwarding to a policy based routing of SMS and e-mail messages, which allows you to perform different actions flexibly depending on the sender, recipient or content of the message. This new feature is the logical further development of the already known SMS forwarding. Customers who may have already purchased the SMS forwarding will not have pay the full price for this new feature. It is possible to upgrade from the SMS forwarding to the Routing. The next big change came at the request of some Multitech® iSMS® users. As already known, Multitech® has stopped the technical development of its very own SMS Gateway. The imminent change of the operator networks from 2G up to 3G is for users of this product a problem because their devices will no longer function. With the new version of the Braintower SMS gateways we give Multitech® customers the possibility to change their devices to a Braintower SMS gateway, without having to change the configuration of their application. The Braintower SMS Gateway is now offering an additional Multitech®-compatible API. This means that the popular Netways iSMS® / SMS Finder® plug-in, which is used to acknowledge alarms from Icinga and Nagios, can also be used with the Braintower SMS Gateway. An article that explains the direct exchange can be found here. As in all previous updates, we have made small changes to the Web interface, bug fixed, improved translations and extends the FAQ. A complete insight into the changes that are active with version 3.3.0 can be found here. As always, we are open to criticism and change requests for future versions. Only then can we continue to develop and continue to offer the best product on the market. If you have any problems during the update process, please contact our support hotline. There you will find help if needed. Last but not least we will give your a glimpse in the future as in fact we are already working hard on version 3.5.0, which will also offer the ability to send and receive messages by telegram. Of course, over the HTTP API and also about the new message routing. We are also planning an Outlook plugin that will allow you to easily send messages to your contacts directly.